Presenting the Leo Awards! 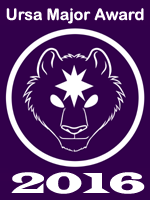 Established in 2017 to highlight exceptional works of literature in furry fandom, it joins our other two awards, the Cóyotls and the Ursa Majors. The Ursa Major Awards, established in 2001, are a recognition of furry media across several categories, only some of which are literary. Anyone in the fandom can nominate and vote. 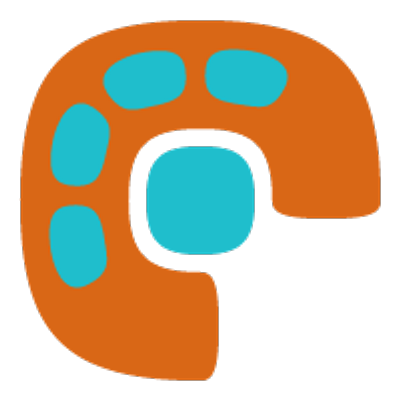 The Cóyotl awards, formed in 2012, are specifically literary, and are selected by members of the Furry Writers' Guild – although winners don't have to be in that group. The Leo Awards have a different arrangement. It was founded by Furry Book Review, a multi-author blog started by Thurston Howl of Thurston Howl Publications (which is separate from the Awards). Nominations can come from the blog's reviewers, or from published authors with enough credibility. Reviewers aren't required to be writers themselves, so the prolific reader can have a say in nominating the stories they like the best. What the Fox? !, my newest anthology, will be published soon by Thurston Howl Publications. It can be pre-ordered, and after March 3, 2018 it should be available for purchasing directly from their online catalogue. 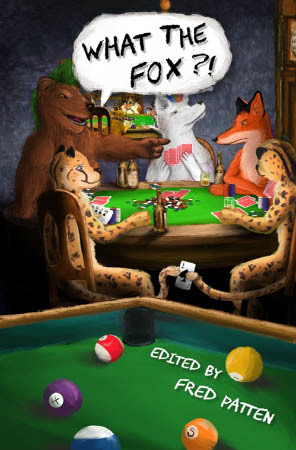 Bringing together twenty-one original short stories and two reprints, this 291-page collection is about anthropomorphic animals in funny situations. It's designed to appeal to both science-fiction and fantasy fans, as well as fans of humor in fantasy. Everything from a llama barbershop quartet to a lupine generation gap, a rabbit king battling a dinosaur (or is it a dragon? ), a human with a spider fiancée, a dog-hating postal worker turned into a were-chihuahua, inept wolf Vikings, to a dog movie screenwriter – and much more! All these stories are for your imagination and enjoyment. Plus you get each author's favorite animal joke, and a recommended-reading list. Nominations for the 2017 Ursa Major Awards will open on January 11, the first day of Further Confusion 2018. The awards celebrate the best anthropomorphic literature and art first published during the previous calendar year. The awards are selected through a two-stage process of nomination and voting. Members of the public send in up to five nominations in each of the twelve categories. The top nominations in each category are then presented for a public vote. On December 11, 2017, Thurston Howl Publications announced the launching of the new annual Leo Awards, to be administered by THP’s Furry Book Review program. They will be furry fandom’s third annual literary award, after the Anthropomorphic Literature and Arts Association’s Ursa Major Awards, presented for works since 2001, and the Furry Writers’ Guild’s Cóyotl Awards, presented for works since 2011. The Leo Awards are still in the formation stage, but they will first be presented during 2018 for works published during the calendar year 2017. Nominations will be accepted by the Furry Book Review Program through March 1, 2018. The date of the announcement of the winners has not yet been set. Unlike the two prior awards, the winners will be chosen by a FBR panel of five to ten author judges. The winners must be approved by 2/3 of the judges. The nominees will be considered for literary merit. Those that are approved of having such merit will be declared Leo Award winners. Thus it is possible to have multiple award winners in each category. The goal of the Leo Awards is to publicly recommend all of the furry works worth reading in each category every year, not just the single best. Dogs of War II: Aftermath, edited by Fred Patten, is launching at Midwest FurFest 2017 in Rosemont (Chicago), Illinois over the November 30-December 3 four-day weekend. 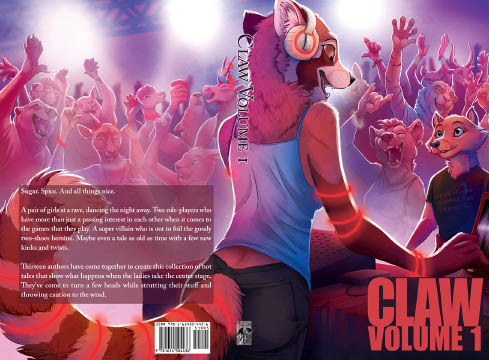 You can pre-order it from FurPlanet, and after the con you can find it for sale through their online catalogue. 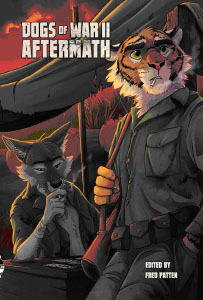 Dogs of War II: Aftermath is an all-original anthology of 20 short stories and novelettes of anthropomorphic animals (not just dogs) in military scenarios, from battle action to boot camps, from the past to the future, on land, at sea, and in space. This is designed to appeal to both s-f & fantasy fans, and fans of military s-f.
From bioengineered military dogs with Artificial Intelligence to a fawn trying to prove he's a stag, a horse sailor on a warship, a canid/ape space war, a self-aware robot bird, a fox soldier passed over for a deserved promotion, reindeer Vikings, animal Sea Bees constructing an island airstrip, and more; these are stories for your imagination and enjoyment. 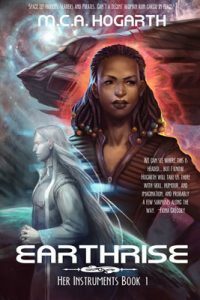 Earthrise, the first book in M.C.A. Hogarth's Her Instruments trilogy, is a comfy space opera which includes some furry critters. Based on my last visit to her work (books 1 & 2 of The Dreamhealers), the furry species are nice and familiar. The crew of the TMS Earthrise has a centaur with wings, a phoenix, a mated pair of bipedal felines, and a throw-pillow tribble with strong mental powers. Most of these are descendants of slave races that humans created centuries earlier. The assembled characters have an almost whimsical balance, yet they still feel realistic. When we join them in the story, they're a well-meshed crew. There's a comforting alienness to each of them, a diversity that avoids stereotypes, but claims labels of diversity within diversity, if that makes sense. We mostly see them through the eyes of their captain. 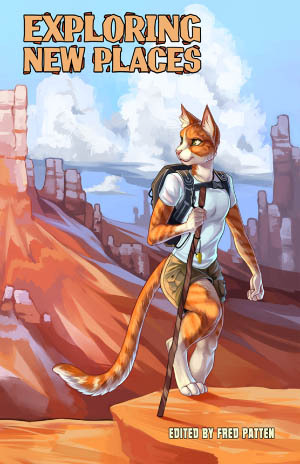 In January 2015, FurPlanet Productions published the first volume of Roz Gibson’s s-f novel “Griffin Ranger”. Now, as of August 2017, the rest of the novel is now available. Gibson has been a furry fan favorite since the 1980s, but as a comic-book artist, not a novelist. She wrote and drew “Jet: 2350” for the Rowrbrazzle in 1987, and went on to create one of his most popular characters, the antihero Jack Salem, the sable psychotic killer, in a series of comics published first by Radio Comix in the 1990s and later republished and continued by FurPlanet, notably in the “City of Ice” series. In 2014 Gibson turned to writing. Her first Jack Salem novelette, “The Monkeytown Raid”, published in the anthology “What Happens Next” edited by Fred Patten, won that year’s Ursa Major Award for the Best Anthropomorphic Short Fiction of the year. She has written a few more stories since then, the most recent being the time-travel thriller “Matriarch: Elephant vs. T-Rex”, published as an original Kindle novella in April 2017. Update 10/15: A statement made about FurPlanet publication on the original article was found to be inaccurate and removed. Gre7g Luterman self-published his furry science-fiction novel Skeleton Crew though Amazon's CreateSpace in August 2014. The cover art was designed by his wife, H. Kyoht Luterman, and inside were over a dozen full-page illustrations, mostly by Rick Griffin. It got excellent reviews. 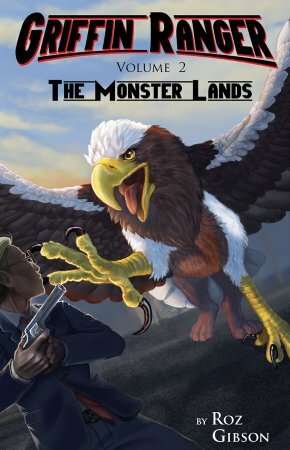 It's now been picked up and re-published in a new, expanded edition by Thurston Howl Publications, with a new cover by Rick Griffin (seen here, to the right) and new illustrations. The backstory to Skeleton Crew is that four centuries earlier, the giant Krakun race came to the primitive planet of Gerootec and offered to hire thousands of the over-populated Geroo as their starship crews. The Geroo who went into space (and their descendants) would never see Gerootec again, but they would live in luxury compared to the backward conditions on their homeworld. Do you read German? I don’t. I have been occasionally checking to see whether any more of the German murder mysteries featuring animal private detectives have been translated into English. Sadly, all we’ve gotten is three of Akif Pirinçci’s eight hard-boiled cat murder mysteries (Felidae and two of its sequels featuring Francis – you’ve probably seen the German “Felidae” animated feature), and the first of Leonie Swann’s Agatha Christie-like sheep murder mysteries (“Three Bags Full” featuring Miss Maple, the cleverest sheep in Glenkill, maybe in all Ireland, maybe in the world). There have not been any translations of the murder mysteries investigated by dog detectives, pig detectives, goose detectives, parrot detectives, and more. 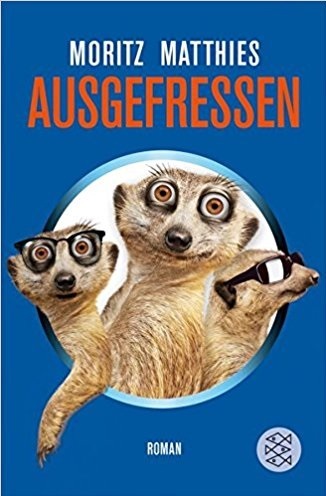 Now it looks like the series by Moritz Matthies starring Ray and Rufus, the meerkat detectives from the Berlin Zoo, has reached its final volume with “Letzte Runde” (“Last Round”) from Fischer Verlag (March 2017, 304 pages). The 2016 Ursa Major Awards have been announced on Friday afternoon, June 30th at the Anthrocon convention in Pittsburgh. The Ursa Major Awards, for the best anthropomorphic fiction of the past calendar year, are presented in twelve categories by the Anthropomorphic Literature and Arts Association (ALAA), and are voted upon by the public on the Ursa Major Awards website. Have you nominated your choices for the 2015 Ursa Major Awards, for the best new anthropomorphic releases of 2015 in eleven categories? Nominations close on February 29, in only two weeks. The categories are Best Anthropomorphic Motion Picture, Best Anthropomorphic Dramatic Short Work or Series, and so on for Novel, Short Fiction, Other Literary Work (anthologies, collections, non-fiction and art books), Graphic Story, Comic Strip, Magazines, Published Illustration, Game and Website. Works first published or released during the 2015 calendar year are eligible. You may make up to five nominations in each category. Nominations opened on January 14 (the first day of Further Confusion 2016) and have been going on for a month. The nominations will be tallied between March 1 and March 14. The final ballot, consisting of the five titles in each category that receive the most nominations, will be announced on March 15, and voting will take place until April 30. All those who send in nominations will be registered as eligible to vote on the final ballot. Those who did not nominate but wish to vote on the final ballot may register to do so.